Though Windows has always put a focus on ease of use, it also has a bunch of advanced features. While the typical user won't spend too much time working in the Command Line Interface or sifting through the Event Viewer, these tools have existed for those who require them. While a bevy of admin tools have always been included with Windows, they aren't always easy to get to. With Windows 8, they may seem at first to be harder than ever. 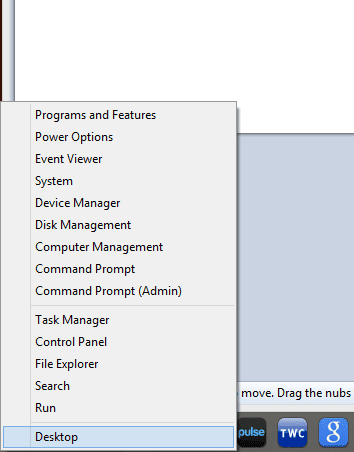 With the loss of the Start menu, power users and admins have to resort to the Charms bar to access the Control Panel or search for the tools they need. While that may seem the only way to get where you need to go, Windows 8 actually has a few secrets that make accessing admin tools a lot easier. It just takes a bit of digging around to find what you need. In Windows 7, you were able to access the Start menu and with a few clicks of a mouse, you could find folders full of system and admin tools. With Windows 8, you can still find them; you just have to open the Start screen, switch to the All Apps view and then scroll all the way to the end of your applications list. That isn't very convenient. While this method is an annoyance, it is understandable. The vast majority of Windows users won't want such tools clogging up their Start screen. Microsoft hasn't forgotten its power users, though, with a tweak of the settings, you can create tiles for many popular admin tools right on your Start screen. Click the lower-left corner of your computer screen to open the Start screen. Access the Charms bar and click Settings. Click Tiles and move the slider under Show Administrative Tools to the Yes position. Once done, head back to the Start screen and you'll find you now have instant access to many of the tools you need. While adding tiles of Admin tools to your Start screen is a fast way to get going, Windows 8 has another secret to help power users get to their tools even faster. One of the first things any new user will learn their first time with Windows 8 is that clicking the lower-left hot corner of the screen opens the Start screen. While this is common knowledge, it is less commonly known that you can left-click the same spot to access a different menu. This menu, also accessible with the Win+X keyboard combination, is an Administrator's best friend. With a single click of the mouse, you have access to the Control Panel, Task Manager, File Explorer, Command Prompt, PowerShell, Event Viewer and more. It's a shame this menu isn't more noticeable, it's incredibly useful for those who need it. In no previous version of Windows has there ever been a baked in option for opening a command prompt in a specific location. There have been numerous third-party apps and registry hacks that allowed desperate users to add this feature themselves, but it's never been native. For those unwilling or unable to tweak, the only option was to "cd" and "dir" their way through the file system. Windows 8 changes that. If you need to open a Command Prompt or PowerShell in a specific directory, simply open the File Explorer and use the graphical interface to quickly navigate to your needed directory. Once there, click the File menu. Windows 8's File Explorer has a File menu unlike any of its predecessors. Though you'll still see a quick way to exit the utility, the important thing to notice is the new "Open Command Prompt" and "Open PowerShell" options. Select either and you'll be given the option to open with standard permissions or Administrator permissions. Though this trick doesn't offer a ton of tools or options, it will serve you well and save you time. Windows 8 does a great job of making admin tools accessible to power users. Though they are well hidden to appease the common users of the world, with a bit of tweaking and a bit of digging, the tools you need most are easier to find than ever. And let's be honest, if you know what PowerShell is well enough to use it, changing your Start screen settings really isn't going to cause you much trouble.